Sora's Abilities screen in Kingdom Hearts. In Kingdom Hearts, abilities are a type of skill that is equipped by allotting Ability Points (AP). These skills can either be active techniques which can be performed at the character's discretion, or passive upgrades which are always active and enhance the various stats or qualities of the character. While many Abilities are used by more than one character, each character has a unique set which reflects their role in combat. While there is no explicit division between abilities, the "Sort" function in the Abilities menu groups them into three main categories. Combat abilities directly affect the skills the user uses in battle. For Sora, these abilities provide defensive and evasive actions and affect his weapon attack combos; for other party members, they provide unique techniques that cost MP to use, which may be classified as "Special attacks", "Support skills", or "Defense skills". Support abilities are passive skills that provide miscellaneous supporting effects for the user, such as boosting MP recovery or item drop rates. Sora also has access to special abilities, offensive skills that consume MP. These special abilities return in Kingdom Hearts II Final Mix as Limit abilities accessible to Limit Form. Sora also gains access to Shared Abilities (共有アビリティ, Kyōyū Abiriti? ), which are equipped to the entire party. They increase the party's mobility in the field, and they cost no AP to equip. Sora, Donald, and Goofy learn most abilities through leveling up, and others by completing certain objectives, such as defeating a boss or completing a mini-game. Sora learns his special abilities by defeating bosses. Other party members possess all of their abilities by default. The party-wide Shared abilities are learned through plot events. 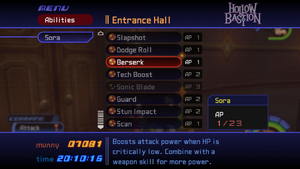 While Sora's combat abilities and special attacks are controlled directly by the player, party members' combat abilities are controlled by their individual AIs. The frequency at which they use their combat abilities can be selected outside of battle from the "Customize" menu. Hai Janpu?) — Powers up your jump, allowing you to reach higher places. Chest at the Monstro: Mouth. Māmeido Kikku?) — Swim faster and more powerfully. In Atlantica, press the button repeatedly to accelerate. Defeat Ursula at the Ursula's Lair. Guraido?) — While in the air, press the button to ride the air currents. Hold down the button to remain aloft. Lock the Keyhole at Neverland. Sūpāguraido?) — While in the air, press the button to fly at high speed. Hold down the button to remain aloft. Defeat Chernabog. ↑ Defeat the Guard Armor at the Third District. ↑ Complete the Hercules Cup time trial. ↑ Defeat the Kurt Zisa. ↑ Complete the Phil Cup time trial. ↑ Clear Pooh's Hunny Hunt with at least 100 licks, Block Tigger with at least 150 points, Pooh's Swing with at least 40 yards, Tigger's Giant Pot within 30 seconds, and Pooh's Muddy Path within five minutes. ↑ Defeat the Parasite Cage at the Monstro: Bowels. ↑ Speak with Cloud after defeating Cerberus in the Preliminary Tournament. ↑ Complete the Pegasus Cup. ↑ Defeat Riku at the Grand Hall. ↑ Complete the Hades Cup. This page was last edited on 20 March 2019, at 13:12.